Dihydroergotoxine review | Does Dihydroergotoxine work? 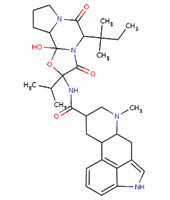 Dihydroergotoxine was discovered by the father of LSD, Albert Hofmann. It is available in prescription form as either a nasal spray or a subcutaneous injection, and is often prescribed to treat severe migraines, patients recovering from stroke, and elderly patients with dementia. Dihydroergotoxine is a vasodilator which increases blood flow to the brain. It also reduces swelling in brain tissue. Dihydroergotoxine is primarily used for recent stroke victims, patients afflicted with dementia, and migraine sufferers, but may have a host of other benefits as well. Some of the milder symptoms of taking Dihydroergotoxine include skin rash, blurred vision, nausea, and nasal congestion. Also, some studies suggest that long-term use of Dihydroergotoxine may lead to heart problems, so make sure you use it under the close supervision of a doctor. Because other studies suggest that Dihydroergotoxine inhibits MAO activity in the brain, it should be used very carefully if you are currently taking any other antidepressant drug. How Does Dihydroergotoxine Help Brain Function? Although its specific mechanism of therapeutic action is unclear, Dihydroergotoxine is thought to increase cognitive function in the brain through vasodilation (the slight interior expansion of blood vessels) and by increasing blood flow to brain tissue. Recent studies also suggest that taking it can help brain function by modulating synaptic neurotransmission, in addition to increasing blood flow to the brain. While Dihydroergotoxine has a number of benefits, we are pleased with its proven effects as a brain and nervous system revitalizer. Wondering about which brain supplements contain Dihydroergotoxine? Take a look at our brain supplement reviews!